This is one event that I will definitely support. I know how it is like to grow up without parents but knowing that there are people out there who care made it a lot easier. This race shows that there are such people. Those who are willing to help. Let’s support this very noble cause. 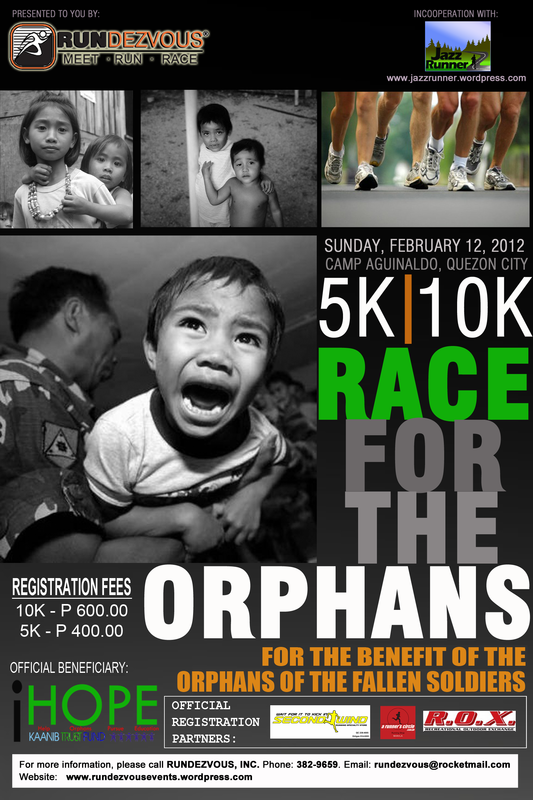 A race for the orphans, a race for your hearts! A very special race for the month of the heart—The Race For The Orphans will stir the Camp Aguinaldo Grounds in the still misty morning of February 12, 2011 each not only to experience running the peaceful grounds of the military camp but to take part in answering the orphans cry for love and compassion. It is with this aim that Rundezvous Events Inc., will stage this event that will provide scholarship grants through “I-Hope”, a trust fund that will support the educational needs of these orphans of soldiers killed in action in Mindanao and for future grantees of the AFP Educational Benefit System (AFPEBS). Each runner pays a modest registration fee of P600.00 for the 10k run and P400.00 for the 5k run. Inclusive with this fee is a nice running singlet available in various sizes, a Timing tag, race bib number and a goodie bag from our sponsors. Our registration Centers will be at the Secondwind Running Stores in Ortigas and Quezon City; ROX at Bonifacio High Street and at A Running Circle (ARC) along Quirino Avenue cornerRoxas Blvd., Manila. “We shall leave no soldiers’ orphan behind”. This is the AFP Educational Benefit System Office’s (AFPEBSO) tagline, an organization which deeply recognizes the heroism in eachFilipino soldier. It is one of the morale and welfare outfits of the Armed Forces of the Philippines that grant educational benefits both to the military personnel and their dependents with the aim of helping them secure a brighter future. As it recognizes our soldiers’ heroism, especially of those who lay down their lives in protecting peace, AFPEBSO gives priority to the orphans of Filipino soldiers who were killed in action. We’ll see you at Camp Aguinaldo on February 12, 2012! All registered runners have a chance to win a free trip for 2 to Boracay. Avail of the early registration promo of 6 Race Kits plus 1 FREE (same category only) good until January 22, 2012. Or call Phone: 6(32) 3829659 c/o of Salie Guarin.